I never really liked chapels in hospitals. I always felt that they were too generic. Whenever I went by an entrance to one I would peek inside and would think that it looked just like any other room in the hospital. I would always feel that the decorator of those rooms was a person who was directed to not offend anyone so the end result was a room that was so non-specific, so mediocre, so blah. Ugh, I am starting to feel queasy just thinking about it. Last week, as I spent several days at Massachusetts General Hospital in Boston with my daughter (read my last post), I found myself walking in the direction of the chapel. Actually, I was headed for the gift shop but it wasn’t opened yet. And then I saw the sign for the chapel. I was curious. 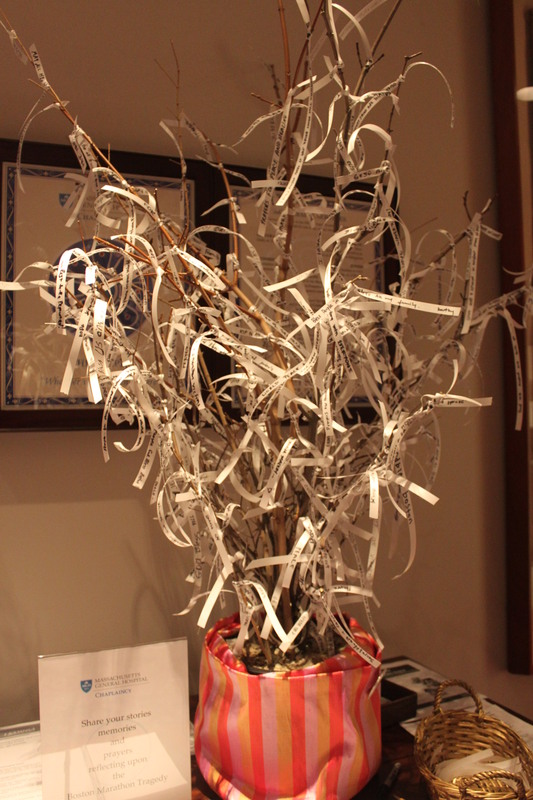 As I approached the entrance, there next to the doors was a “prayer tree” on a table. 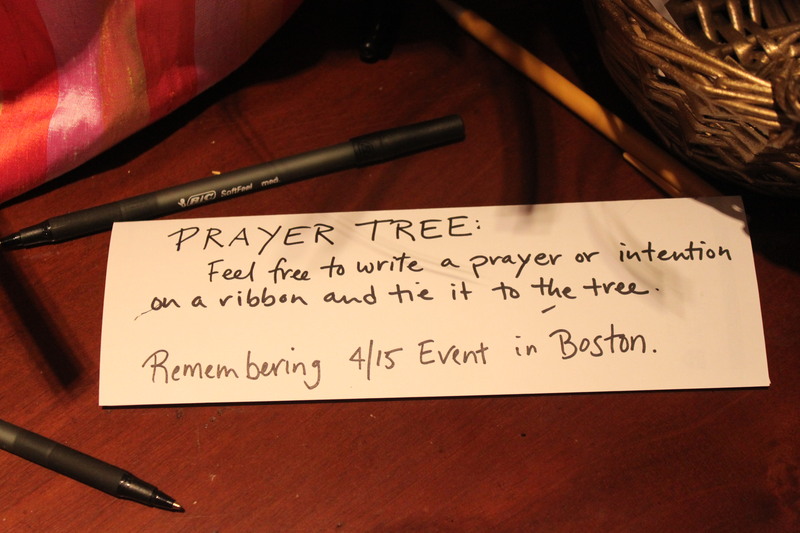 It was placed there in response to the recent tragic bombings. 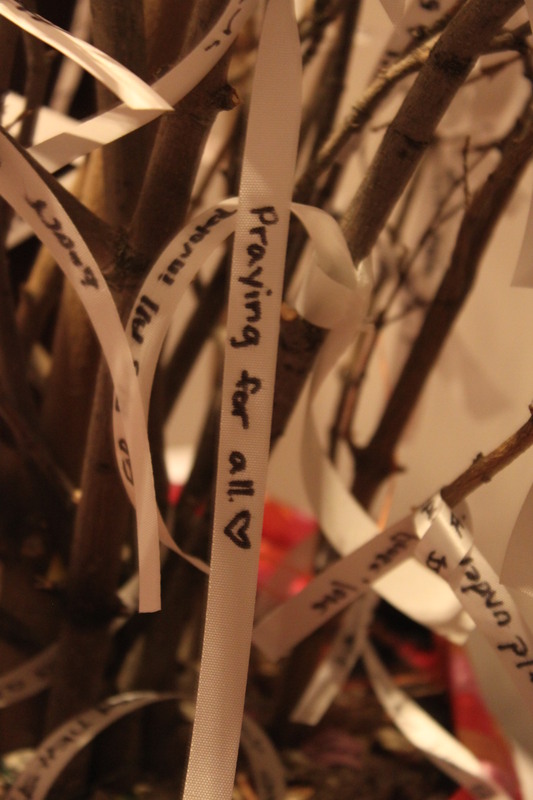 People were asked to write prayers and thoughts on ribbons and tie it to the tree. I thought it was an excellent tool to help people start the healing process after such a horrible event. I entered the chapel and was surprised to find a beautiful room. There was a stained glass rose window in the front of the chapel with stained glass windows on the sides. The room was illuminated by subtle light coming from recessed lighting in the tall ceiling as well as from filtered light from the windows. It was a marked change from the glaring brightness of the hospital hallway. It was also quiet in the chapel. I welcomed the silence with a big sigh as I released some of the tension I was feeling because of my concerns for my daughter. I sat in the back row and examined the room’s details. Even though it was a lovely chapel, it still looked “generic”. Being a Christian all my life, I am accustomed to seeing traditional Christian symbols when I enter a “place of worship”, which is the very definition of “chapel”. Still, it was a nice quiet place to pray for my daughter and to write in my journal. Then, I noticed the people. As I sat and prayed, I observed the people who came and went. In the span of an hour (yes, I sat there for an hour – it was early and my daughter was asleep), many people entered that little chapel. Some people stayed for just a few short moments while others sat for several minutes. I watched their demeanor as well. Some rushed in, genuflected while crossing themselves (I knew they were Catholic – please don’t be offended – I’m Catholic too), said some prayers, and exited quickly. One woman walked in with a cup of coffee in one hand and a laptop in the other. She plopped herself down in a corner chair and proceeded to tap, tap, tap away on her keyboard as she sipped her coffee. More than one elderly couple showed up, speaking to each other in “quiet” stage whispers; the husbands’ “Huh?’ being very audible. There were medical personnel too. A couple of them stopped by and I imagined that they were praying for compassion, courage, and skill to be able to care for the dozens of people who come through the hospital doors. And then there were ones that immediately knelt down, bowed their head and prayed. By their posture, I could tell that they were concerned, maybe anxious, maybe even at their wit’s end over what to do about their loved one. A few tears were even wiped away. And then it hit me. These chapels are not made for the patients, they are made for the ones that care for them. They see their limitations when it comes to caring for their sick loved ones. 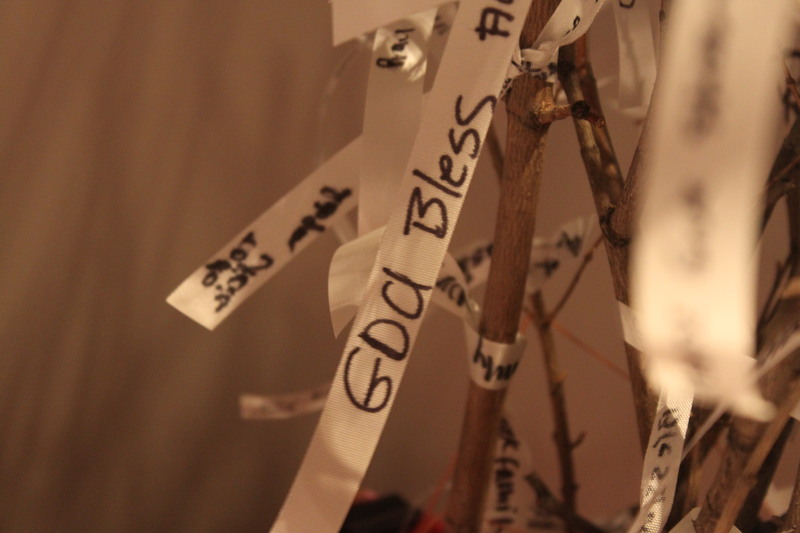 They come here for solace, comfort, quiet, peace, and maybe an answer. Maybe they are here reaching out to God or a someone bigger than themselves to help them deal with suffering, illness, and sadness. Hospital chapels are made for them. And these places are necessary for the spiritual health of the community. Mass General has done an excellent job of providing a beautiful place of worship in a very busy place; a place of solace, quiet, and peace. 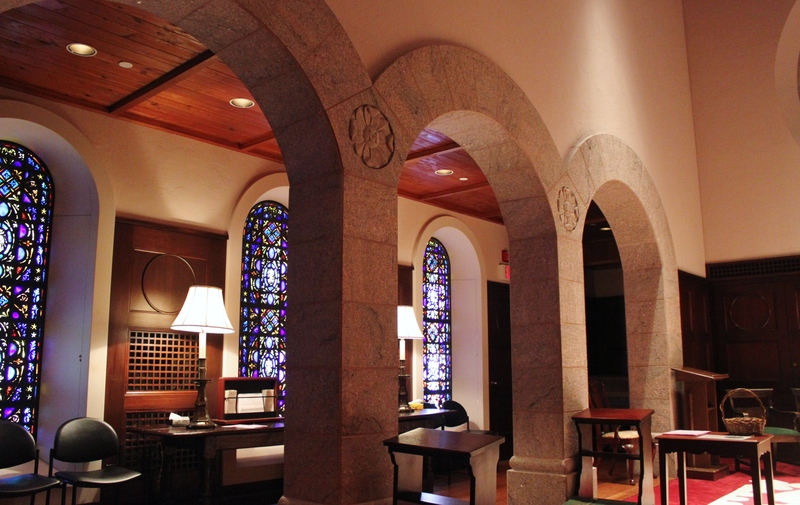 Being an RN and familiar with hospital chapels, i agree that they are generic in appearance, some more generic than others, unfortunatley, but it’s usually anxious family members and friends who spend time there. Hospitals are overwhelming places for those who are not in the medical professions and concerned family and friends often feel helpless and frightened by what they see around them. 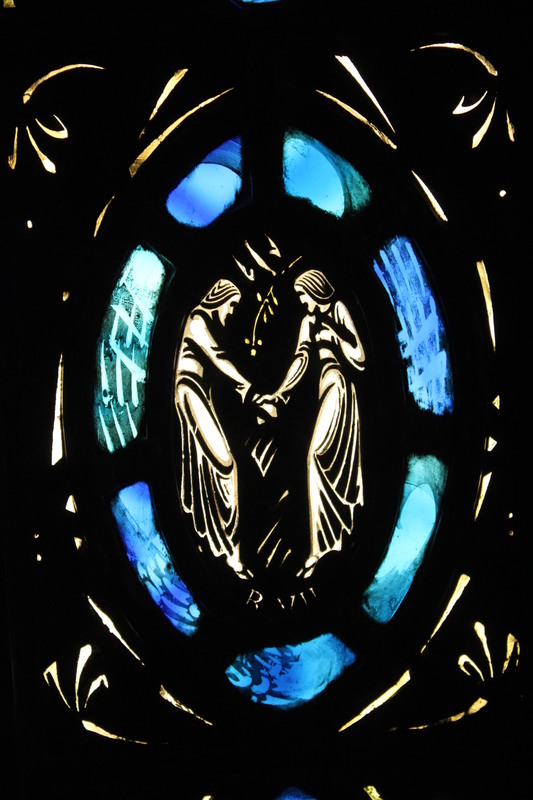 The chapel, no matter how generic, is a place of quiet and solace. Thanks for the pictures of Mass General. “I can be sort of like a chapel … I can be a quiet place for those who need rest from the noise …” Beautiful. Beautiful. Beautiful. This is an absolutely beautiful post. I’m glad this space was available for you when you needed it. The comparison of you being like a chapel is very true, but something I had never really thought of. Thanks for writing this out and for the lovely pictures. Thank you so much. Yes, I really am glad that I stopped there. I work in a hospital. Every day, I pass by the chapel. It is definitely used more by family members. When I pass by, I always have a compassionate half smile because I never know what is the person in there is going through. Without exchanging a single word, I have gotten shy smiles, I have seen tears and received nods. Basically, I hope I convey the message that I am here to help and I do care. That’s beautiful Nadeen. I am sure those people feel comforted by your presence. Your last paragraph speaks volumes.